"These cookies are warm and delicious on a cold winter's day. Cut them into any shape to fit your holiday celebrations." In a medium bowl, mix together the molasses, brown sugar, water and butter until smooth. Combine the flour, baking soda, allspice, ginger, cloves and cinnamon, stir them into the wet mixture until all of the dry is absorbed. Cover the dough and chill for at least 3 hours. Preheat oven to 350 degrees F (175 degrees C). On a lightly floured surface, roll the dough out to 1/4 inch thickness. Cut out into desired shapes. Place cookies 1 inch apart onto ungreased cookie sheets. Bake for 8 to 10 minutes in the preheated oven. Remove from the cookie sheets to cool on wire racks. 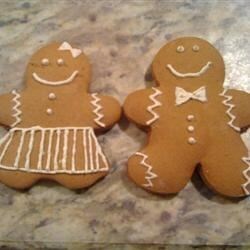 Learn how to make fun and festive gingerbread cookies. This recipe is excellent. I did add grated orange peel and substituted honey for molasses to give it more of the Liebkuchen (German gingerbread taste) and it was excellent.